Welcome to Van's Chairs for Reenactment! 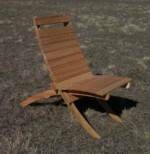 Handmade furniture for all your outdoor or indoor needs. 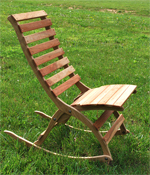 Perfect for Rendezvous, living history re-enactment, deck and porch seating and many other uses. Each item folds or collapses down into it's own handy carrying package, handle built in! Every piece is handmade for the finest quality. 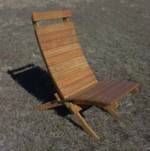 Legs are made from white oak or ash, seats and back are red oak. Cherry and walnut woods are $20.00 higher per piece. All cross framed furniture is screwed together and then the screw holes are plugged for that true look. All furniture can be shipped U.P.S. Weight limit capacity for each piece should be 275 lbs. This folding rocker, more commonly known as the "collapsible rocker in the 1700's", was used throughout the 18th century. Entirely made of hardwood, pegged screw holes for period look, and dipped in boiled linseed oil for long life. Seating for those more stately events. This is our coveted Knights chair with a convenient backrest. Backrest is held in place with sturdy wooden pegs and is removable for transport and storage. Chair and backrest are made of durable Ash wood. Just as strong as Oak, but half the weight. Very much like the Large Duke Chair- just a bit smaller. Seating for those more stately events. Backrest is held in place with sturdy wooden pegs and is removable for transport and storage. Chair and backrest are made of durable Ash wood. Just as strong as Oak, but half the weight. This Roman design chair was commonly used in the Dark Ages. Folds flat for storage. Great as a stool or as an extra table. Because you asked for it. A chair that will hold you and your armor. Larger version of the campaign chair. Folds flat for storage. Great as a stool or as an extra table. Most men like this Large chair.18" wide seat. Our Large chair with a taller backrest. A lot of women seem to love this chair, best for tall men, too. 18" wide. Great chair for a person with back strain. Our High Seat Chair with added support to the lumbar. 18" wide. Early canvas chairs for those who want a popular canvas chair from the 1700's. Three sizes available, 12", 15" and 16". Weight limit 275 lbs. 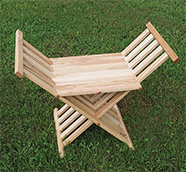 Backs fold down to form a stool. 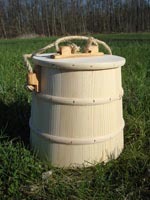 This furkin style bucket is an authentic addition to your camp. Our Water Bucket holds about 2 gallons. Similar to our water bucket with a snug fitting lid. 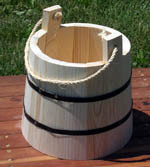 This is a military style bucket that could be used with cannons. These are great solid wood construction canteens. Correct from the 1700's to present day. Large canteen holds about a quart. Wax lined, cotton strap. Need more room? Any of these tables will do. 16"X 16" table. Use this as a table. 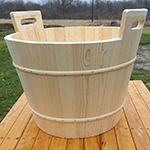 Our brand new Laundry Tub is now available for order! The 11" tall tub holds about 6 gallons. All laundry tubs are sealed with paraffin and are ready to use. This Laundry Tub is about 14" tall and holds about 10 gallons. 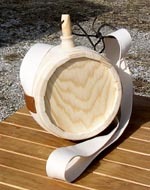 The top of the handles are reinforced with a stip of ash wood. All laundry tubs are sealed with paraffin and are ready to use.